ADDIS ABABA, May 23 (Xinhua) -- The UN Office for the Coordination of Humanitarian Affairs (UNOCHA) disclosed on Monday there are 1,613,436 Internally Displaced People (IDPs) in Ethiopia. The displaced people figure by UNOCHA is for those registered up to April 30, 2018. In a press statement, UNOCHA said about two thirds of IDPs were displaced by conflict while the rest were displaced by climatic conditions like flooding and drought. Oromia and Somali regional states were the most hard-hit areas in the UNOCHA report, accounting for more than 1 million IDPs. 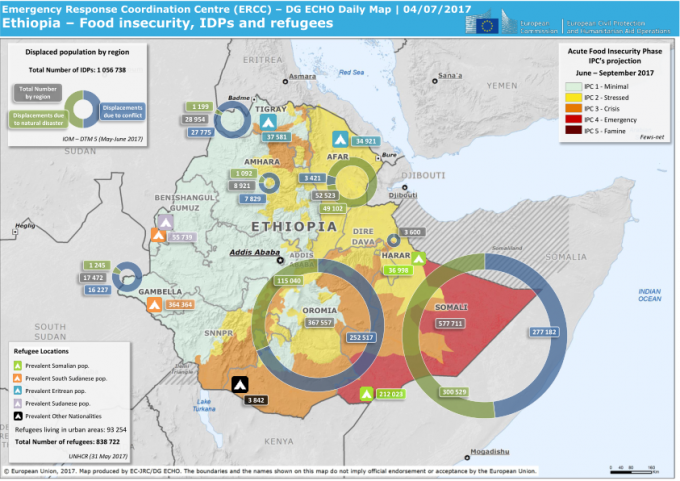 In addition to the more than 1.6 million IDPs, Ethiopia also hosts around 915,000 refugees, the second largest refugee hosting nation in Africa next to Uganda. Most of the refugees hosted by Ethiopia come from neighboring countries of Eritrea, Sudan, South Sudan and Somalia, fleeing drought conditions and conflict in their home countries.